I had based this trip on the long rage forecast about a week ago where it was supposed to be a mostly sunny day and mild, so I planned to have the day off. As the week progressed I watched the forecast deteriorate day by day to a mild day of mostly cloudy and rain. Well at least that part the forecasters got correct! I had gotten in touch with a friend of mine earlier in the week to tell him I was coming down, so this venture was not a solo one. Friday morning wake up, and true to the forecaster's word it was lightly sprinkling. Holding to my commitment to my buddy, I packed up the truck and headed off in the rain. 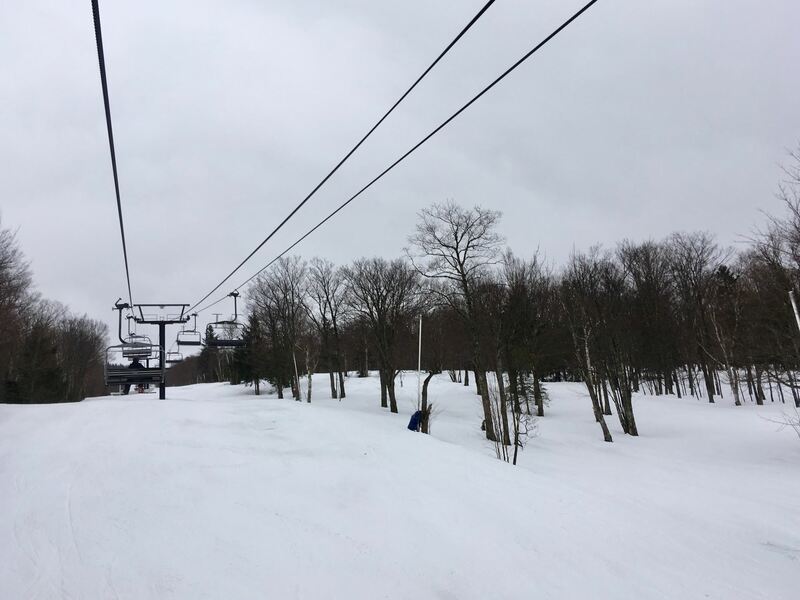 I don't normally ski in the rain but if I didn't go, then the visit to Sutton would have been a write off, and I would have to wait until next season. Note to self: Plan the trip to Sutton earlier in the season next time! I arrived at the mountain just before 9 to cloudy skies with a very light sprinkle and the temperature of around 4 degrees. I got all geared up and went to the ticket desk inside to pick up my pass, and ran into a school friend of mine who has been at the mountain for a number of years, Melanie. Always a pleasure to see her, and to catch up. After a quick chat I got the pass and headed for chair 2 the Main Quad for the first run down the Sutton Ik. Everyone I got the chance to chat with was pleasant, welcoming, and in a great mood considering the weather today. 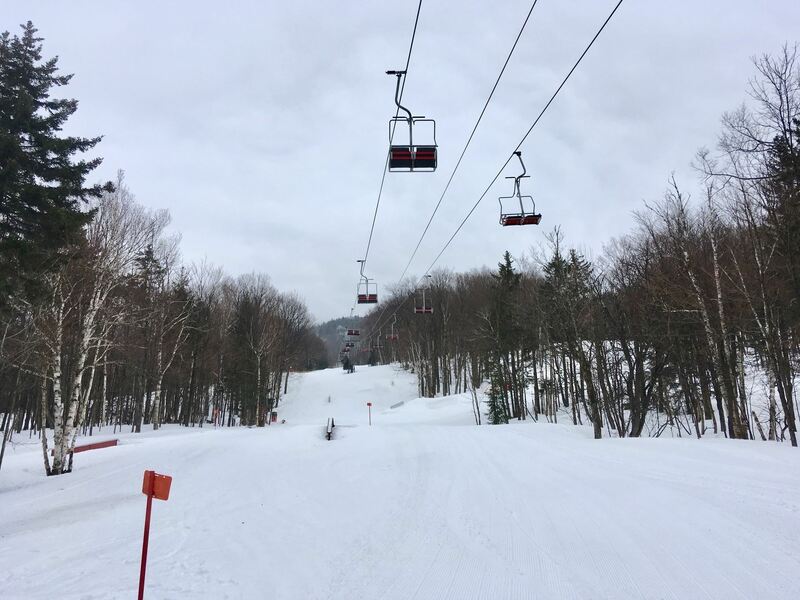 57 trails were open along with 4 lifts spinning. The conditions were of a spring granular over a firm base. Coverage was still pretty decent with the amount snow received this season. There was still quite a bit of snow still left in the woods. The glades were still covered well enough to ski them with care. In some areas spring is slowly starting to show through with a few icy patches here and there. Still plenty of space to avoid them. On the way down I got a message from my buddy to meet him over at the bottom of Chair 3. I made my way over, and he was there with some skis he brought with him that we were going to test out. It ended up being a group of 6 of us so basically from there the day turned into a testing day in the rain. We had a variety of different skis to try, and today was a good day to see how they would perform in the spring snow. We spent the rest of the day on the Mohawk and the ABC under Chair 3 testing and trading thoughts about the skis we were on. The Mohawk had been groomed and there was some soft snow left untouched on the sides of the trail. A great trail to see what these skis could do. I had the Blizzard SRC, Volkl Race Tiger SC, Salomon Shot SL, & the Blizzard Wrangler 9, just to name a few of the half dozen skis or so I tried out. 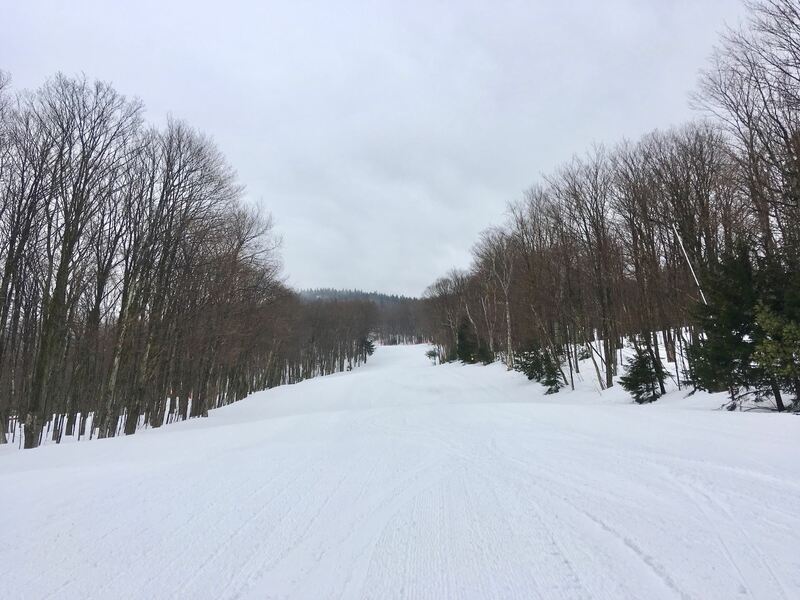 With the summit chalet open, there was a cat making the trip up with a load of wood for the fire place there, so we had a fresh groomer track every run we did to ski on. We finished the day at around 1:30, pretty much soaked through. 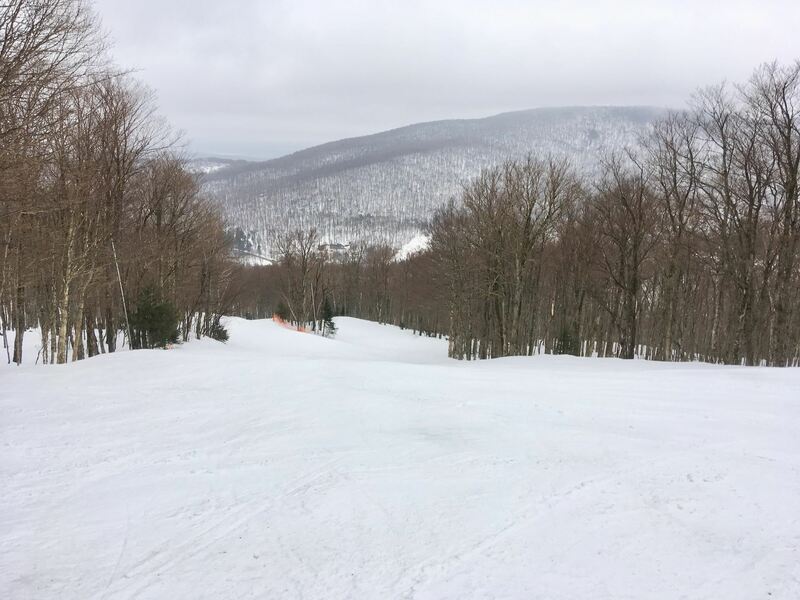 Even though I didn't get to other sections of the mountain this time, I had a great day trying out different skis, and getting my spring skiing legs back. Like I had mentioned earlier, I need to better plan my visits here for next season to get the full effect of what this great mountain can offer. Until next season Mont Sutton, I'll be back! A couple of experimental photos in B&W. Great report Paul. Sutton definitely has a unique charm. I love the mountain chalets all over and the fireplaces. And don't forget the nostalgic double chairs. The place is frozen in time which is its biggest draw and selling point. Plenty of narrow trails, curvy and intersections. Endless options and possibilities to come down. Last time I was up, I stayed at the Auberge des Appalaches. Really cozy and welcoming. Really can't go wrong with Sutton. 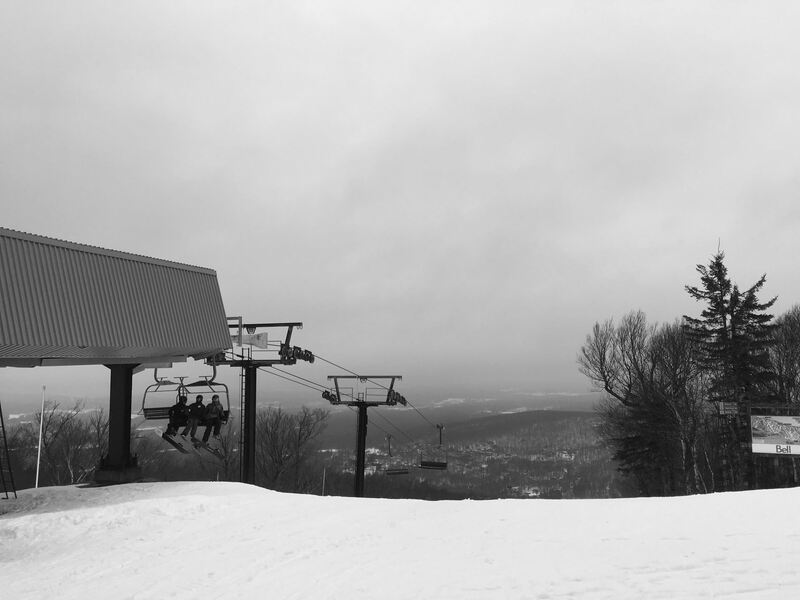 With the day off work today, and taking advantage of that, Mont Sutton was the choice of destination. I left Sherbrooke at a little after 7 under partly cloudy skies. When I arrived at Sutton for 8:30, it was cloudy and about 2 degrees above zero. The conditions were a bit more tricky that I was anticipating, as the mild temperatures from yesterday and the freeze from last night made for some hard surfaces. 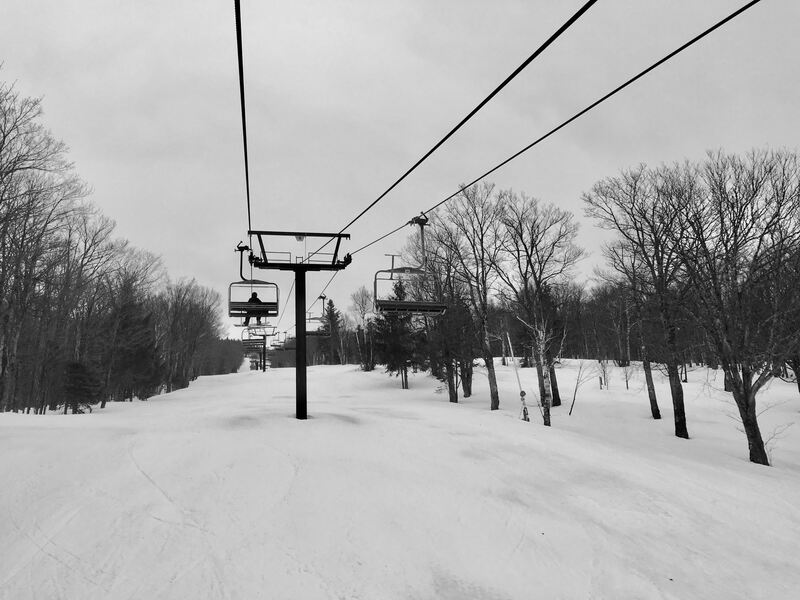 57/60 trails were announced as open with 2 lifts, Chair 2 the main Quad and Chair 4, the fixed grip Quad were spinning today. The wait in line for either lift was non-existent. The day began on the Sutton iK and the Mohawk to warm up. The Sutton iK was groomed granular on a hard base. The Mohawk, was not groomed but was well covered with some loose granular with the temps being mild at the lower altitude. After a few runs I moved over to Chair 4 and the Dynamique via the Youppi Youppi trail. Coverage here was decent but some places were starting to show some wear. It was icy in places and you had to be aware of that and choose your lines accoringly to avoid them. The Youppi Youppi and Dynamique was not groomed as well and made for some fast skiing. A couple of rides up Chair 4 and then it was Alleghany's for the route back to Chair 2. 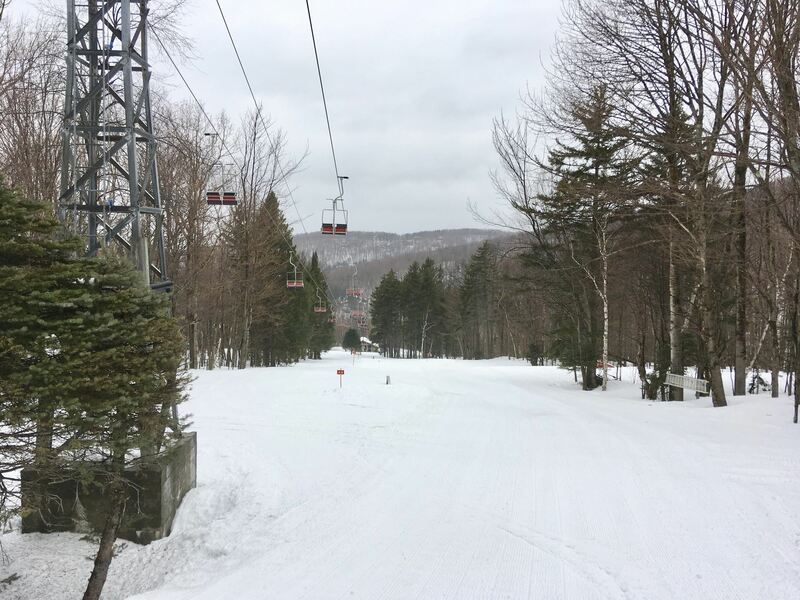 The glades were open and skiable but they were starting to get thin. Pretty much all the snow we received from the last dump we got has pretty much either melted and has been skied off. The last run down was on the Alouette which is a natural snow trail and was thin and bare patches were visible. With the conditions as they were, pretty good but tougher that I am used to, my legs were screaming and I "tapped out" by noon. Overall a decent day but I missed the boat after the big dump to ski Sutton the way you should ski it! Knee deep in white gold.